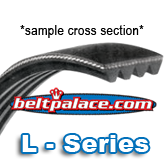 Home > Heavy Duty V Belts > Poly-V Ribbed (Micro -V) Belts > L Section Poly V Belts. 3/16" Rib Width. 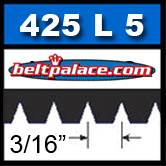 Industrial L Section Micro V belts > 425L5, 5 RIB Poly-V belt: Each Rib 3/16 Inch wide (Pitch). Meets RMA oil and heat resistant standards. Meets RMA static conductivity requirements. Smooth running at high speeds for minimal vibration.